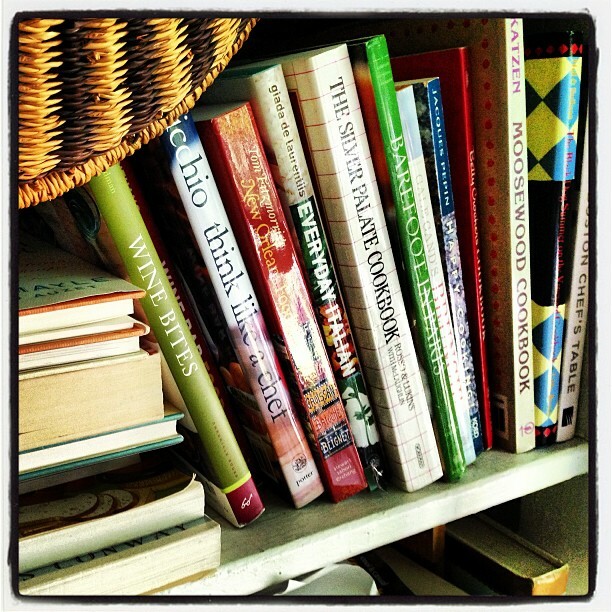 In addition to cookbooks, I love reading books about food: about eating, about working in kitchens, about restaurants I’ve been to or want to go to or those I could never afford. I probably have too many books, frankly, but just as there are people who will never throw away that pair of jeans they just might wear again someday (you never know when acid wash will come back in style), I never toss a cookbook I think I might make something from someday (I’m bound to have a fondue party someday, right?). This is probably the book I refer to most often, for two reasons: the recipes are incredibly well-written and simplified for the home cook, but they are still authentically Mexican. Rick Bayless is known for his Mexican cooking, of course, and he has other books with more complex and elaborate recipes, but this one is a great introduction for anyone. He focuses on healthy Mexican food, gives substitutions for ingredients that might be hard to find, and has a glossary in the beginning of ingredients and where to get them. Her tone can be a little highbrow at times (e.g., referring to mac & cheese as “macaroni gratin”), but Alice definitely knows her ingredients and does as little to them as necessary to make them delicious. I’ve made quite a few of the recipes from this book and they have all been excellent. It’s a great reference to have in the kitchen, especially for cooking almost any vegetable. I adore everything Bourdain does, and this book is no exception. The writing is sharp and funny, and the recipes are solid. This is true French cooking, simple when it can be and more complex when it needs to be. The best recipe in the book is the Boeuf Bourguignon: I’ve made it many, many times and it’s absolutely foolproof. A good friend gave me this book a few years ago, and I wasn’t sure I’d get much use from it as I don’t often cook big weekend breakfasts. However, since I’ve had the book I have found myself referring to it regularly, both for ideas (the pictures are deliciously inspiring) and to follow actual recipes. One recipe in particular–eggs in ham cups–was impressive for company but incredibly easy. I had never made crêpes until I read her recipe and realized there was no magic to it: just confidence! And Gale’s 3-Alarm Bloody Mary recipe is killer. 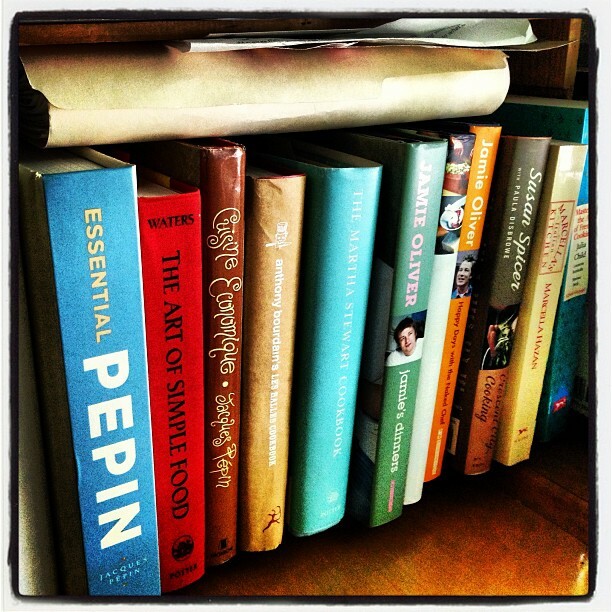 His first and, in my opinion, still his best cookbook. This has some spectacularly good recipes, and I love that he isn’t afraid to use chillies in everything. This is where I got my inspiration for the spicy shrimp and couscous salad dish – a regular summer rotation in our house. 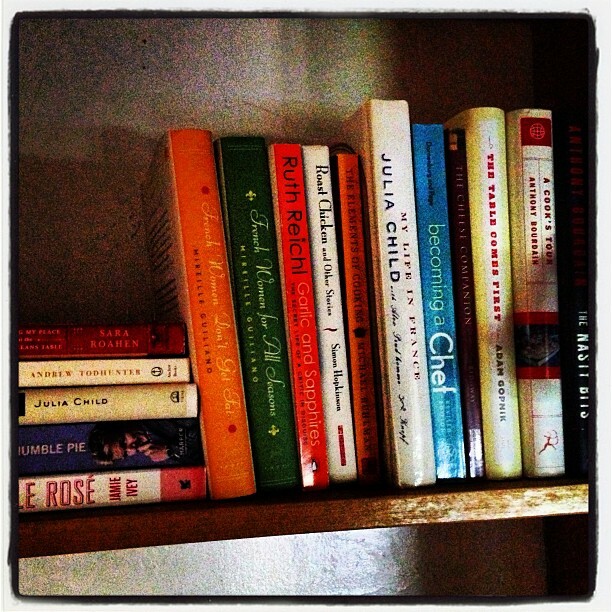 What are the cookbooks–or books about cooking–you couldn’t live without in your kitchen?